Two senior boys show what it's like to appreciate each other's company. Do guys expect to get a gift on Valentine’s Day? How would guys like to celebrate Valentine’s Day this year? In a random survey of 125 Morton East students, the highest vote was (just chilling) with their significant other. (Shockingly, 31 Morton East students said they would “blaze” with their significant other.) A trip to the arcade, going to a carnival or fair, cruising in a car, and bowling and laser tag also received honorable mentions. ”It’s very interesting that my sophomore boys in my AP Euro class don’t have a girlfriend,” history teacher Mr. Sonny Thevalakara said. Sophomores pay more attention to their school work rather than having a girl/boyfriend because it’s the first year in high school and they don’t want to lose focus. Seniors are more into creating bonds with other people know that it’s towards the end of our school years. 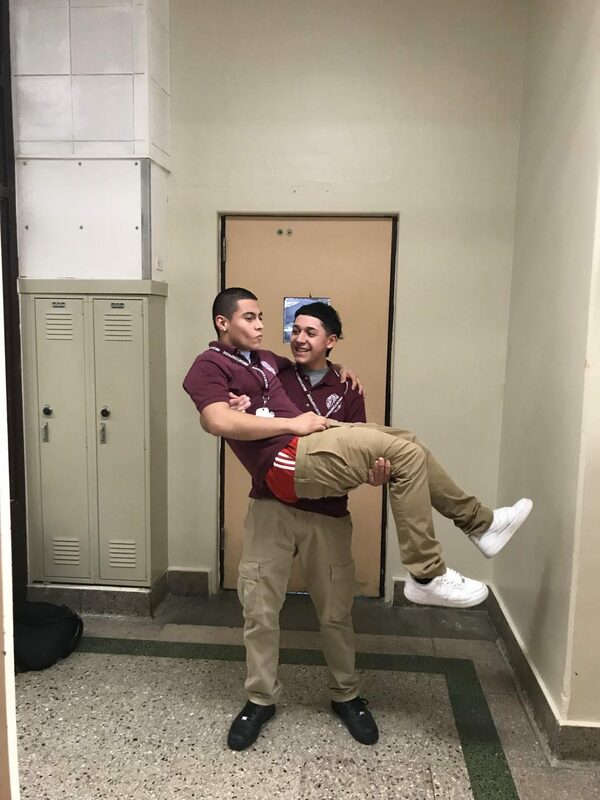 “Valentine’s Day to me is when you and your partner celebrate each other’s love,” Senior Jamie Lopez said. Seniors are the ones that would celebrate Valentine’s day with their partner because they are the most interested in a relationship and spending time with them because most seniors have jobs and don’t get to spend a lot of time with their partner. “I would want to get blunts and some snacks as a gift,” Junior Brian Raygoza said. Many upper-class-men prefer to get blunts and weed over snacks and presents since they are more grown and not all guys enjoy receiving stuffed animals and chocolates such as others do. “I would rather receive money and bud because with the money I can buy something I like and smoke my bud,” Sophomore Alonzo Chavez said. For the most part, many male students believe it’s better to get snacks as a gift because they have favorites, and it’s a very simple thing they enjoy and it’s all about the thought that counts. For older married men, it’s all about the wives, and many don’t expect to receive a gift. If they receive love and compassion from their significant other that’s all they need/want. In conclusion, guys should be gifted with clothes and accessories too; it doesn’t always have to be the guy showering their ‘gf’ with money and presents. Most high school students prefer to be gifted with money, while adult teachers prefer just to go out to a movie or eat with their loved ones. It’s all about receiving love and compassion rather than expensive gifts or jewelry. I think that this article is very accurate. Almost every year guys with a girl/boyfriend think about what their partner would want but guys rarely get gifts themselves. As a male student at Morton East I think it’s a great idea that the article was written because at times girls think their boyfriends or girlfriends want a gift but most of the time they only want to be together and have a good time. I think that it very resonable why a guy would perfer different gifts than girls. I think this because most people perfer gifts that fit with their personality. Sine many guys like playing games, its understandable why they would enjoy a trip to the arcade. However, there are also guys who are satisfied with just reciving love and compasion. I truly think the guy should get something to because it shouldn’t only be the girl getting stuff on valentines day. I think it should be equal.I really like this article because it shows the opposite view from what we used to seeing. alot of people automatically think guys dont want anything.